Fishing for Kids - Young and Old! 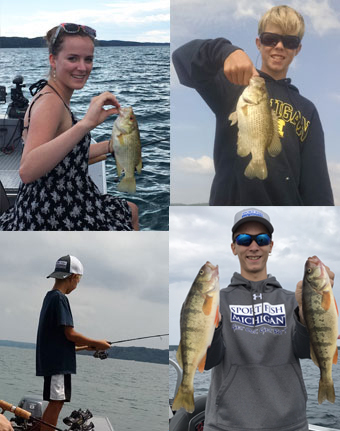 Sport Fish Michigan has the perfect opportunity for families to get their kids out to fish on Crystal Lake, close to the Port of Frankfort. Crystal Lake is known for its outstanding yellow perch fishing and is also home to a spectacular rock bass population. Rock bass are feisty fish and are the perfect fish for anybody who loves to catch fish. 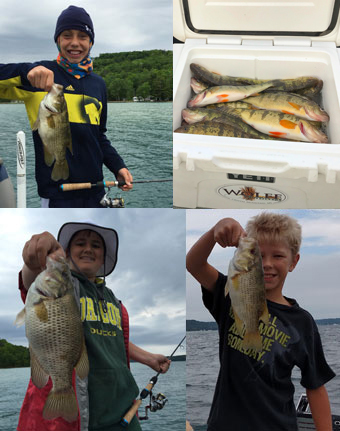 Sport Fish Michigan's rock bass trips are perfect for children as an introduction to the fun sport of fishing. Crystal Lake's rock bass grow very large, and "rockies" over 2 pounds are regularly caught. Rock bass out of Crystal Lake are also incredible table fare and are perfect for a fish fry! Yellow perch are fun to catch and delicious table fare, making them a true crowd-pleaser. Perch are abundant in Crystal Lake during all seasons. Anglers - young and old - enjoy the thrill reeling in these feisty fish. Sport Fish Michigan's Captains and Guides know Crystal Lake intimately, and love to take people out on this beautiful body of water. Our boats are fully equipped with all safety gear and are DNR inspected. Everything you need for a fun fishing experience will be provided, including rods and reels, drinks and snacks. We also have tackle specifically designed for kids fishing, giving them the best opportunity to catch fish!